I have long felt the urge to visit this city, the Hiroshima Peace Memorial Park and Museum, as well as the A-Bomb Dome which was designated as a UNESCO World Heritage Site in 1996. Now that I am here I feel uncomfortable perusing the few pamphlets picked up at the information centre. I cringe at things to do, attractions, dining, accommodations and nightlife advertisements screaming for my attention from glossy flyers. 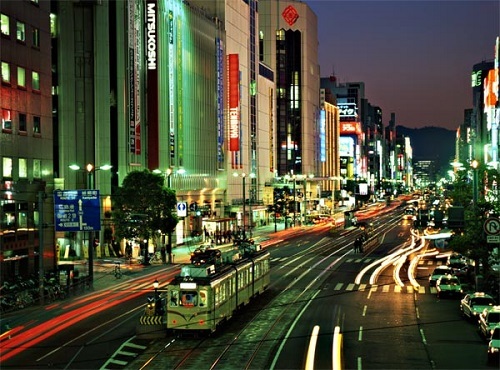 Hiroshima street view at night. Photo Credit to Lami Japan. As a thinking person, I can’t be a cheerful tourist or a traveller here. Perhaps the mood hanging over me since leaving Kyoto may have less to do with the fact that I’m a few days shy of a month-long journey and am tiring, but more to do with the fact that I have come to this city with the freight of its history weighing me down. Though it’s not the only city to suffer wartime carnage, in this place the once unspeakable and unthinkable happened. Devastation that could not be blamed on the gods (and I speak figuratively), except perhaps for creating us in the first place. It was no tsunami which indiscriminately and dispassionately laid waste to this city, but a conscious act. In this moment the appalling enormity of the threshold crossed here oppresses me. Were great ideals well-served by that action? How do we reconcile the way rhetorical axes of evil shift (time and again) according to various ideologies or economic alliances? Or justify the ecological sword of Damocles that nuclear armament and energy have created for all? Of course, no metropolis can live in a shroud for all time. None do. I suspect that unlike new arrivals in town, long-term visitors and those who live here must become somewhat inured to its vibe after time, or perhaps they simply coexist with the past as best they can. Or as humans have done for millennia, build over the ruins, try not to think about it and carry on. 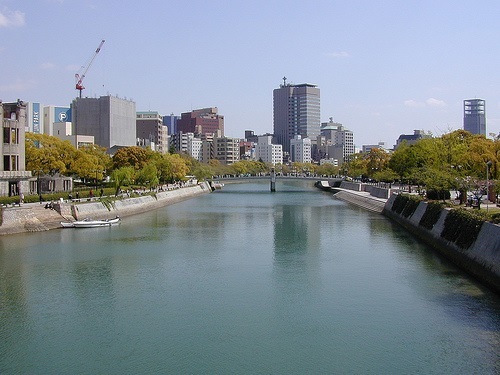 River View in Hiroshima. Photo Credit to Lami Japan. I know by visiting the Hiroshima Peace Memorial Museum I will see more than enough horror even though much of it will be left to the imagination or sanitized through museum glass and sepia tones of time. Nonetheless, in spite of my trepidation, I am compelled to bear witness. To pay my respects to the blameless individuals who lost their lives and suffered in this place. This entry was posted in Japan, Travel & Culture and tagged Hiroshima. Bookmark the permalink. Words, of course, are the most powerful drug used by mankind.